What of the Children of Calais? What of the Children of Calais? I tell you that tonight these children sleep in woods, on slag heaps, in industrial zones. Tonight they may be pepper-sprayed again, have their sleeping bags removed by police and most likely their shoes too. It is not too late to be part of doing the right thing. Yesterday was a strange day. I scrolled through my photos from the previous year and had to remind myself these are events that I witnessed with my own eyes. Yesterday was the anniversary of the day the Calais ‘jungle’ burnt down in a crescendo of chaos which saw 10,000 people moved from this unregulated but tolerated refugee camp which Human Rights Watch has declared a victim of excessive force and abuse from the police (www.hrw.org/news). On Tuesday night I watched the BBC2 documentary This World: Calais, The End of The Jungle and recognised this is not only the story of the characters who were filmed, but it is my story and the story of many of my friends, those who are refugees and those who were or continue to be volunteers. In the documentary the police declare that the national stockpile of tear gas in France is 3000 canisters. There were 38000 used on the Calais ‘jungle’. I was there for some of those. I know the sound, the smell, the taste. On the day the ‘jungle’ burnt down I remember the hundreds of compliant boys lining up before dawn at the warehouse designated for processing them and moving them to accommodation. I remember the pandemonium produced by there being no translators present and the gracious act of a multilingual refugee who stepped up to become master of ceremonies. I remember urgent phone calls to boys on a list to find them and tell them they are being transferred to the UK the next day. Oh their faces! Shock, surprise, disbelief, relief, fear. I remember the Sudanese boy whose caravan was surrounded by French police with whom we had to negotiate his re-entry in order to collect his belongings. He had been to line up at the processing centre since before day-break as ordered, but was not processed and told to return to the camp, only to discover his caravan was already in the process of being demolished. I remember, I smell, I hear the fires, going from once construction to the next, the hissing of gas bottles heating up to explode, the frames of familiar places smouldering, the remnants of life, and the boys taking time in the midst of armageddon to shave their hair to look their best before the next leg of their journey ensues. I remember 60 children unable to get into the ‘safe’ container area, left to sleep on the road outside with no community leaders, no faith leaders to guide them, and volunteer youth workers bemused and furious at how a country with stringent safeguarding policies would cause this to happen. I remember a small team of peacemakers sitting together for the last time drinking tea and shedding tears for the trauma they were seeing, I remember goodbyes with people carrying their bags, not knowing if we would ever see them again. But yesterday was a day of conflicting emotions for me, because on Tuesday I proudly stood in front of 350 people who refuse to forget the children of Calais, for yes, they are still there. 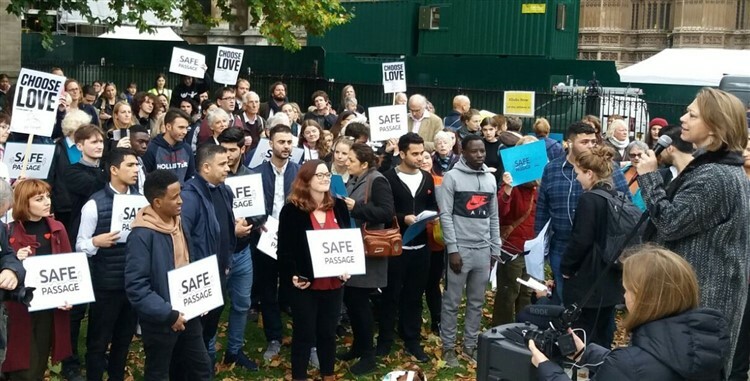 We stood at this Action organised by Safe Passage and thanked the Home Office for working efficiently to bring 750 of those children over to the UK during the traumatic demolitions. They should never have had to wait until that point, especially those with legal right to come and join family here in the UK. The Home Office could have got itself into gear at any point, but, small mercy, at least they stepped up at that point. And the children are thankful. 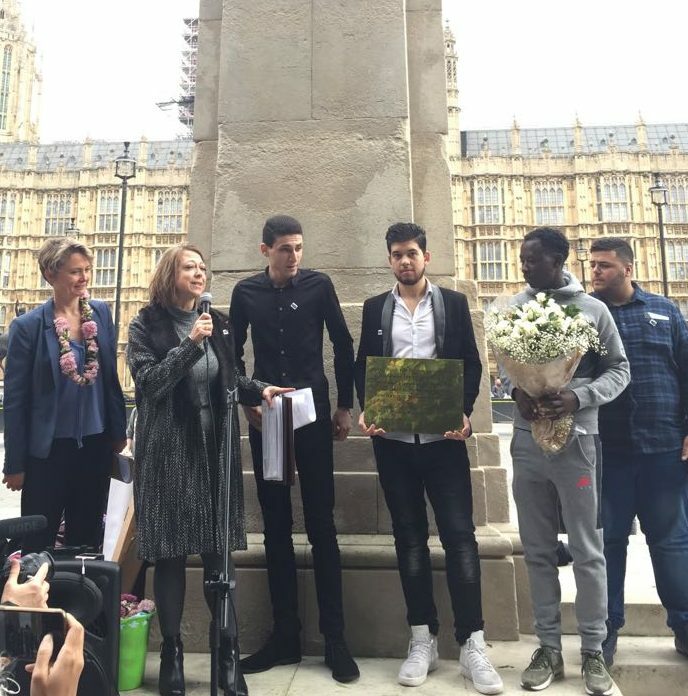 On Tuesday I saw Ishmael, a Syrian boy I helped Safe Passage (http://safepassage.org.uk) put on a bus to the UK, stand with Lord Alf Dubs, the man who made it possible for Ishmael to come. I heard him speak of his university course and his hopes to rebuild his country. I saw two Sudanese boys my friends at Oasis Trust cared for in the safe house they ran in the immediate aftermath of the demolition to help the Home Office cope with the scale of transferals. I had helped Oasis out for a few days as they set up. I heard Eritrean Tekle, a boy we drove to Calais in August to see his 14 year old brother Dawit, speak of his brother’s 8 month ordeal waiting for his legal claim to come here to progress at a snails’ pace. He is a traffickers dream target – desperate, frustrated and losing hope in the legal system. I looked out and saw volunteers who have joined our Peaceful Borders teams offering listening and humanising initiatives and supporting a safe house caring for the most vulnerable in Calais, and I saw many people from our baptist churches who have given time to lobby MPs. We stood, all 350 of us, asylum seekers, refugees and British nationals together, asking our government to once again step up and quicken the processes for the 200 children still stuck in Calais. Some are new to Calais, but others have been there since the demolition of the ‘jungle’, only now the immigration office there has been closed. The office they are now meant to go to is 2 hours away and they cannot make an appointment, so even if they make the journey they are likely to be turned away. What of the children of Calais? Don’t believe the press that says the closure of the camp solved the problem. I tell you that tonight these children sleep in woods, on slag heaps, in industrial zones. Tonight they may be pepper-sprayed again, have their sleeping bags removed by police and most likely their shoes too. France and Britain have some of the strongest safeguarding policies in the world, but clearly many of our MPs don’t give a fig about children fleeing war or famine or persecution. There are moments in history when we have to stand up and do the right thing. We’ve witnessed it before. It is not too late to be part of doing the right thing. A backbench debate discussing the situation in Calais has been scheduled in parliament for Thursday 2nd November. We need MPs there. They are busy people, but we can persuade them that they need to prioritise this. Write to your MP. Go and visit them as soon as possible. Tell them they need to be at this debate. Please. The children of Calais need you. The Revd Juliet Kilpin is a member of the Mission Theology Advisory Group and we support her in this urgent and necessary work. She is a Baptist minister, a co-ordinator of Urban Expression and Campaigns Leader for Safe Passage. She regularly visited the ‘Jungle’ in Calais and has been heavily involved in supporting the efforts of reuniting refugee children with family in the UK.